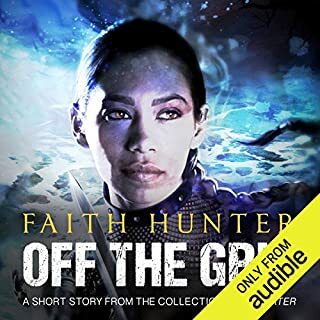 In Off the Grid, Jane goes on what looks like a simple mission for the Knoxville blood-master - finding a missing Mithran. 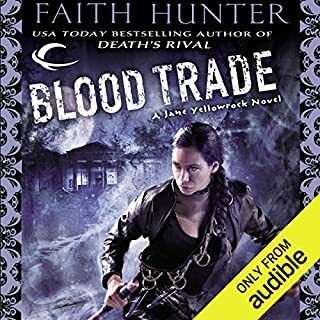 Her search leads Jane to a young woman named Nell, a woman with a scarred past and a strange power, a woman who may hold the key to saving the missing vampire, if Jane can convince her to assist. 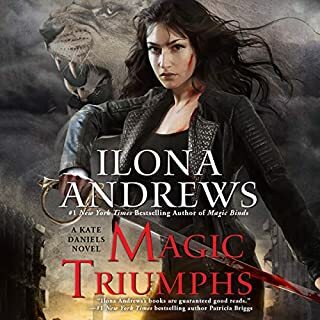 Now, to uncover the identity of the vamp who wants Leo’s territory, and to find the cause of the vamp-plague, Jane will have to go to extremes...and maybe even to war. 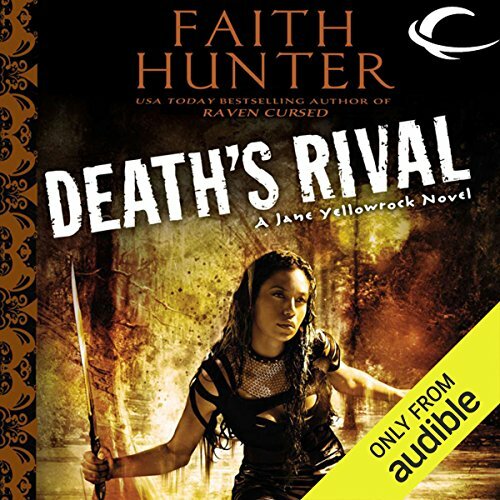 ©2012 Faith Hunter (P)2012 Audible, Inc.
What made the experience of listening to Death's Rival the most enjoyable? Great story and great narration. I finished this book late at night and I was so hyped up I couldn't fall asleep. I wanted more. I have really enjoyed all the books in this series but I found this story more suspenseful. I loved it. It is hard to compare this book to another I have read because of the main character's duel nature. The Alfa Omega series by Patricia Briggs, also a great series, has a bit of this with Charles and Brother Wolf. Charles is also influenced by his Native American heritage. 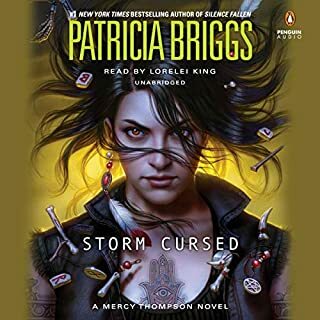 While they are very different in many ways, if you like Mercy Thompson and/or Alfa Omega by Patricia Briggs I bet you will like Jane Yellowrock too, but I suggest starting with book one. I think Ms. Hvam does a great job bringing Beast to life. I just don't think I would ever have fully understood the Jane/Beast relationship without her masterful narration. There is always a chuckle or two in a Jane Yellowrock book but this one put a lump in my throat more that once. That surprised me. 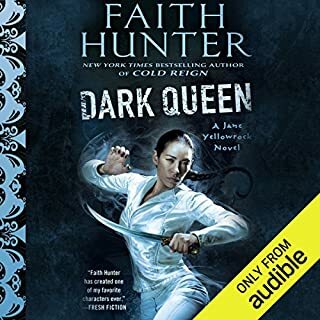 I just hope Faith Hunter will write #6 fast, fast, fast! This is the fifth book in the Jane Yellorock series. It was a spectacular book. We learn a ton about Jane’s past. Things come to a head between Jane and Leo. Beast plays a large role in the story as well. 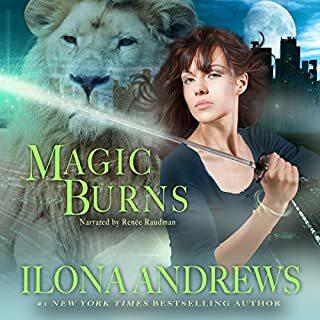 I listened to this on audiobook and it was absolutely amazing. 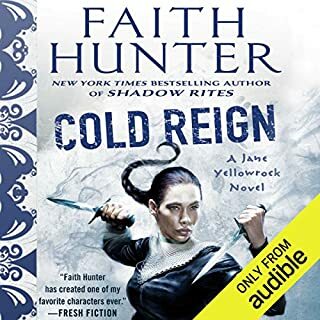 The narrator captures Jane’s personality perfectly and does an excellent job distinguishing between voices. I actually enjoyed listening to this series more than I enjoyed reading it. 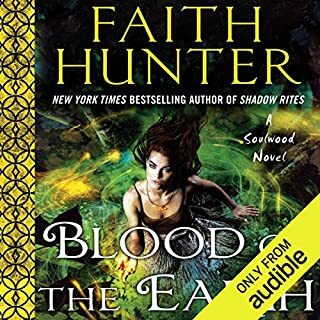 So I highly recommend listening to this on audiobook if you enjoy audiobooks. Vamps are breaking out in a horrible virus of sorts, the only cure is provided by a mysterious master who comes in and takes over their territory in exchange for the cure. Jane is asked to look into this virus and figure out who the mysterious master vamp is. Jane also hires in two guys to help with her home security; this adds a lot of fun to her house and to the story. Excellent continuation of this series. We learn a lot more about Jane's past and Beast plays a large role in this story as well. There is a ton of action and an interesting mystery that ties in with Jane's past nicely. The book is also full of Jane’s sarcastic humor and wit. A lot is revealed about Jane’s character in this book. 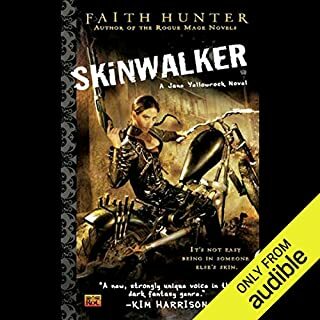 Her bloody past is discussed and she is forced to confront some truths about the nature of skinwalkers in general. Things also come to a head between Jane and Leo and the result is a rather painful truth that Jane is forced to face. Bruiser and Rick are in the story quite a bit as well. It was wonderful to see Rick, but watching him and Jane struggle with their relationship was painful at times. Bruiser is an interesting character and watching how he is torn between Jane and Leo says a lot about his character. Beast comes to the forefront in this story. The balance between Beast and Jane is changing; Beast is becoming more intelligent and more prominent in Jane’s thoughts. It’s interesting to watch Jane and Beast come up with some sort of balance. It’s also fun to watch Beast interpret Jane’s human thoughts and actions. The plot that drives the story about the vampire virus was an interesting one. I loved how it all tied into events that happened in previous books and also ties in with Jane’s origins. This book was incredibly well written, very interesting, and very nicely tied in with the rest of the series. Some surprising things happen in the story that left me very curious to see what happens next. I thought this was the best book in the series yet. Overall an absolutely wonderful continuation of this series. 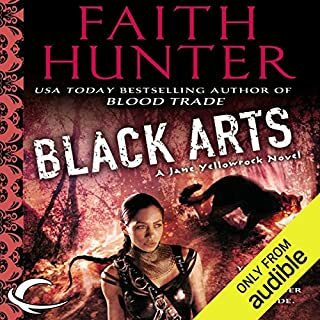 The plot is interesting and we learn a ton about Jane’s history and about the history of the Skinwalkers. Some of Jane’s struggles to balance Beast and the men in her life are painful to read about; but Jane’s witty sarcasm and Beast’s cat-like humor add a lot of fun to offset the darkness. The book is action-packed and just so interesting. I can’t wait to read what happens next. 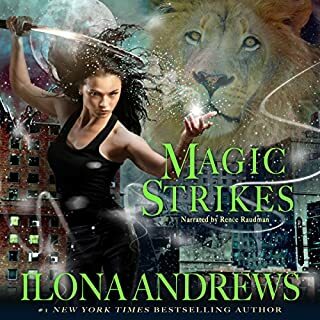 This whole series is highly recommended to fans of action packed urban fantasy. I love the Narrator's accent and ability to sweep the listener along. She is pitch and expression perfect. She reads in exactly the way I feel I would read, so it doesn't ever feel as if I want her to slow down or hurry up. Jane is my favourite character, she is very well rounded as a person, extremely capable but not over confident. it has also been possible to watch her grow as a person throughout the series. Christine definitely brings the Southern character of the books to life, which will be clear to all listeners/readers now instead of just those who are already familiar with the american south. I think this is the best Jane Yellowrock book yet. It's all around good writing, good characters and a good story. There's some foreshadowing without giving to much away, there's some missing pieces that come together, theirs beast being cunning and funny, and theirs little twists that aren't obvious. So many books have these little twists that you can "feel" coming a mile away, if that makes any sense. I enjoyed just getting caught up in this book. I love this series, and 5 books in am still enthralled. I can't say that for all the series I read. This addition to the series was full of action, really full of it.. I have enjoyed it.. New fantastic characters get added to the series and interesting developments happened to many characters including Jane. .... especially Jane. There is also the absence of some characters, which wasn't so bad. Its ending was very good and ..... will you have to get there to know what happens.. but it was good. 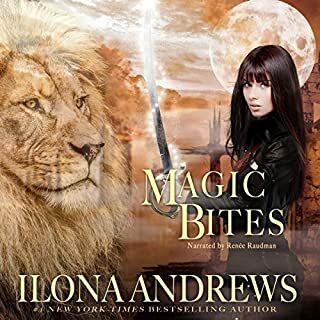 Again the narrator did a great job as usual narrating the characters and giving life to them.. she is very talented. This book sent me into peroxisomes of glee! 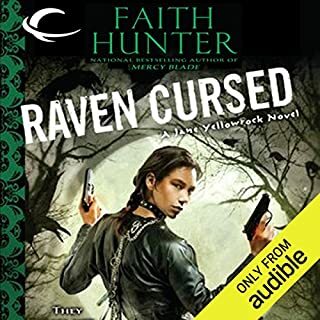 Faith Hunter and Christine Hvam are a pairing made in audio heaven! Jane and Beast never disappoint but in this book they also have some surprises. Jane learns some hard lessions and we get introduced to some very interesting new characters. If I am not imagining things there is some foreshadowing going on in the beginning that may be relevant later. I love this series so much that it's one of the few I will listen to several times. 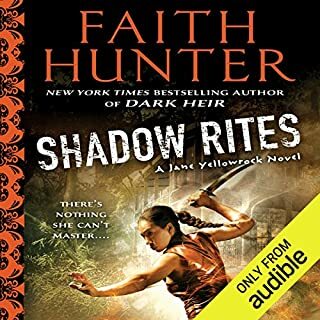 Where does Death's Rival rank among all the audiobooks you’ve listened to so far? Loved it love all her books. Sorry I have to wait for the next one to come out. What was one of the most memorable moments of Death's Rival? I would love to see jane in Wisconsin in the winter. Would make a great backdrop. Crisp white snow, big fat snowflakes falling from the sky on her beasts pelt and such. 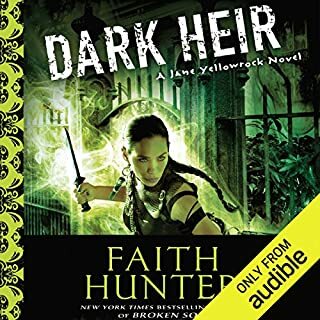 They should make a Jane Yellowrock movie! I have loved Faith Hunter's writing since her Seraphs Series(I have signed copies). 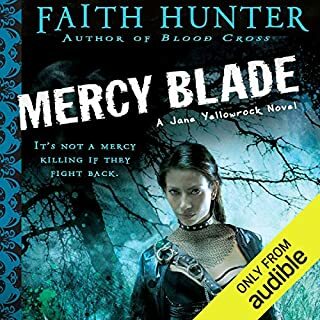 But the Jane Yellowrock novels have fast become my favorite series of all the authors I read...er well listen to. 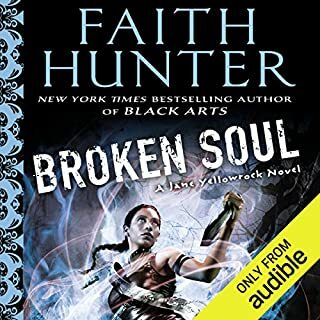 (I am new to the audible books experience) The story line is unique and inventive and the characters well developed. 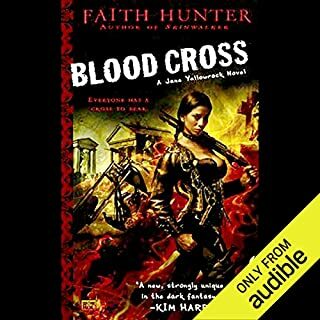 Khristine Hvams was very easy to listen to and I was easily able to discern what characters were who. I look at all the books being made into movies and think that this series would make an awesome movie. I have met Faith Hunter and she was a very genuine nice person. Keep writing Faith... we need MORE! Great read, love Yellowrock! But I really would love to here some juicy lovers details in the future! I wasn't really thrilled with the ending ( won't spoil it here).